Category: What is the meaning of the Parable of the Dragnet? Jesus tells the Parable of the Dragnet, or the Parable of the Various Kinds of Fish, in Matthew 13:47-50. Jesus prefaces the parable by saying it illustrates an aspect of the kingdom of heaven. The story concerns fishermen using a dragnet, a weighted net dragged along the bottom of a body of water to collect an assortment of fish. In the parable, the dragnet is cast into the sea and pulled onto shore full of all kinds of fish. Then the fishermen sat down to the business of sorting the fish into the “good” and the “bad.” The fish worth keeping were gathered into containers, but the rest were tossed away. Jesus then interprets the parable for His disciples: “This is how it will be at the end of the age. The angels will come and separate the wicked from the righteous and throw them into the fiery furnace, where there will be weeping and gnashing of teeth” (verses 49-50). This parable is similar to the Parable of the Wheat and the Tares (Matthew 13:36-43). Both parables concern an end-times sorting, aided by angels, when believers will be separated from unbelievers once and for all. Just as the net was cast into the sea drawing many fish, the gospel message is spread into the world, drawing many people to it. Just as the net gathered all types of fish, regardless of their value, so the gospel attracts many people who neither repent nor desire to follow Christ. 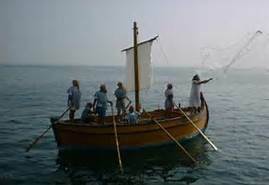 Just as the fish could not be sorted until the net was pulled ashore, so false believers masquerading as true Christians will not be made known until the end of the age. These “bad fish,” or false believers, can be likened to the rocky soil and thorny soil in Matthew 13:5-7 and to the tares in verse 40. They claim to have a relationship with Jesus, saying “Lord, Lord” (Matthew 7:22), and Jesus’ reply will be “I never knew you. Away from me, you evildoers!” (verse 23).